I am Mark Venzke. I have lived in Gainesville for most of the last nine years. I am an entrepreneur who is working to establish an electric-powered taxi company in Gainesville. I ran for Gainesville City Commissioner at large seat 1 in the January, 2012 election. I studied landscape architecture at Purdue University. I have worked for seven years as a designer, draftsman and technical illustrator in architectural and engineering offices. I have worked for twenty-three seasons in most sectors of the landscape industry. Since my early adulthood, I have been involved in issue advocacy and political campaigns. Since I ran for Commissioner, I have applied myself to learning about public administration through trainings, workshops and lectures offered by local governments and by the University Of Florida. I want to be mayor to assure affordable and responsible energy from our municipally owned utility, to improve the integrity and democracy of our governance and to spread the successes that our city has realized in the innovation and technical sectors to the trade, service and retail sectors. Gainesville, Florida, U. S. A.-- Within forty-five minutes of the polls closing in Gainesville, the city had a new mayor. With vote portions of about fifty-five percent and about forty-five percent respectively for Ed Braddy and Craig Lowe, Ed Braddy became mayor. "Let all of us do our parts in all of our roles--as elected officials, as city staff members and as citizens--to make Gainesville the best it can be for all of us through the coming years--years that could be very challenging for our country," Mark said. Gainesville, Florida, U. S. 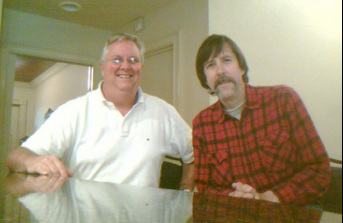 A.-- Mark and fellow, eliminated, mayoral candidate, Pete Johnson, met today at Pete's home. "I had not known Pete until the first candidate forum of our campaign. Both of us quickly realized that we have very similar values and views," Mark said. "From about the middle of the campaign, both of us have wanted to have a talk, but we have not had time to do so until today," Mark said. Their conversation was wide ranging, covering the general and runoff elections, Gainesville political issues, local and national politics, leadership, entrepreneurship, business ventures and family histories. "Pete is a great guy. I wish him continued successes, and I look forward to future dealings with him," concluded Mark. The Mark For Mayor Internet site gets another record number of visitors! Gainesville, Florida, U. S. A.-- A new, likely never-to-be-exceeded, record number of visitors visited the Mark For Mayor Campaign Internet site on election day, March 19. 197 visitors visited and made 202 page views. The Mark For Mayor Internet site gets a record number of visitors! Gainesville, Florida, U. S. A.-- A record number of visitors visited the Mark For Mayor Campaign Internet site on March 18, the day before the election. 163 visitors visited and made 169 page views. Gainesville, Florida, U. S. A.-- Mark engaged with passing students in Turlington Plaza on the University Of Florida campus this afternoon. From 12:00 p.m. to 1:00 p.m., Mark greeted and talked with students around a raised planter in which his campaign yard signs were emplaced. Turlington Plaza is the most high-foot-traffic space on the campus and is a traditional location for students and others to promote their organizations, events, activities and causes. Consequent to the issuance of a news release about his session, three teams of journalism students interviewed him there. "To hold an event one hundred yards from a journalism school pays," Mark said laughing. 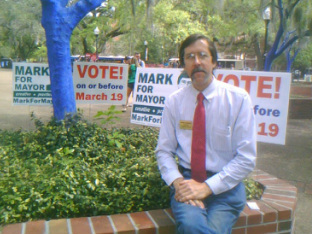 Since the January, 2012 election in which Mark ran for Gainesville city commissioner at large seat 1, Mark has been preparing himself to run again for local public office. 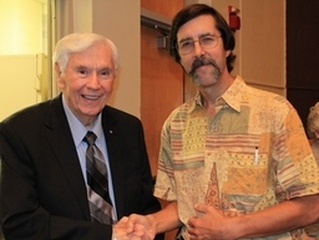 Mark shakes hands with highly regarded former Florida governor, Reuben Askew, after the program, Conversation With Florida Governors, on the University Of Florida campus. 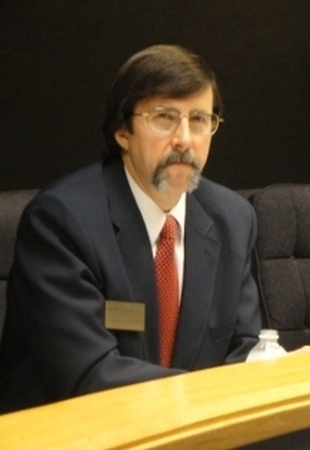 Besides often attending and commenting at Gainesville and Alachua County commission meetings, he has participated in a number of local government trainings and workshops and has attended numerous lectures on governance matters by distinguished statesmen, authors, journalists and academics at the University Of Florida. 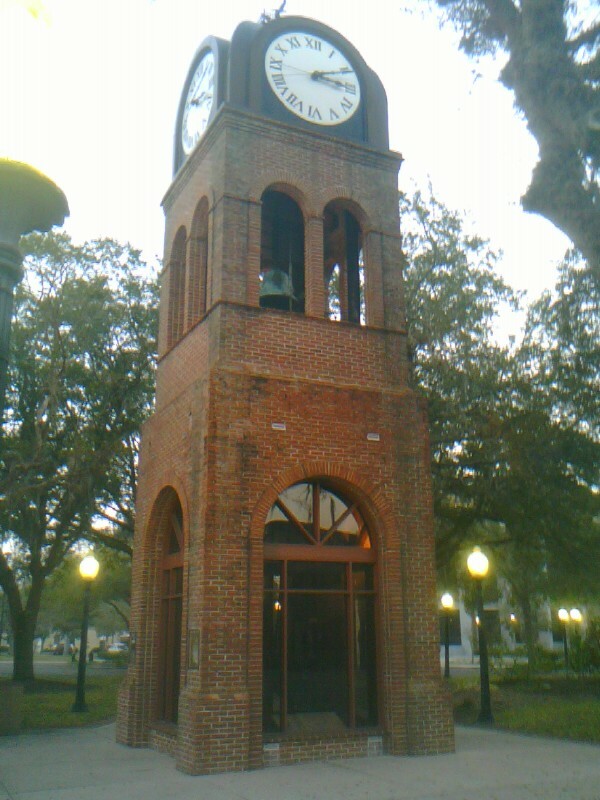 One of our iconic landmarks, the Gainesville clock tower stands at the southwest corner of the Gainesville government campus in downtown Gainesville. as we update it regularly. on Saturday, April 26, 2013 at 12:01 p.m. 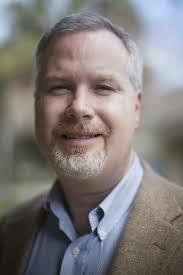 In an editorial published in the Gainesville Guardian newspaper on January 23, 2013, local pastor and peace activist, Karl Anderson, appeals to office holders, candidates and citizens to deal with each other with civility. "Have you ever thought about how some people allow politics to cloud their sensitivity of humanity?" "We all should want people to enjoy this fruit called life, regardless of party affiliation. At what point did we lose our Godly compassion for others? I have read ugly things said about others on both sides of the political fence." "In conclusion, let us allow love to rule our hearts, actions and mouths as we all seek a harmonious and productive life in this world beneficial for all." "A safe, healthy, attractive, prosperous, sustainable and nurturing city is ours for the making."